Put 1/2 inch of water in the bottom of a large baking dish (use 2 baking dishes if needed). Place each acorn squash cut side down in the baking dish and place in the oven. Cook about 40 minutes or until the flesh is tender. Meanwhile, add the olive oil to a large skillet and place over medium heat. Add garlic, onions and bell pepper and saute for 5 minutes. Remove the casings from the sausages and crumble the meat into the skillet with the onion mixture. Break the meat up more with a spoon as it cooks. Once the meat is cooked, turn off heat and set aside. Remove the squash halves from the oven. Pour out the water and place the squash halves cut side up in the same baking dish. Evenly sprinkle the brown sugar into the bottom of each squash, reserving 3 tablespoons for later use. Fill the squash halves with the sausage mixture. Top each half with remaining brown sugar. Place the stuffed squash back into the oven and bake for 15 minutes or until the brown sugar on top is melted. Serve immediately. Place the squash cut side down in a large baking dish. Place in oven and bake for 45 minutes or until squash begins to soften. Remove squash from oven. Turn the squash halves over so the cut side is up and leave them in the baking dish. Put 1 tablespoon butter, 1 tablespoon brown sugar, 1/2 teaspoon salt, 1/4 teaspoon of cinnamon and 1/8 teaspoon nutmeg into the bottom of each squash half. Return the squash to oven and bake another 20 minutes. Serve immediately. Slice the acorn squash in half. Scoop out the seeds and place in microwave save bowl. In batches, cook squash halves in microwave for 5 minutes at a time until all halves are very tender. Scoop squash away from the rinds. Put the squash in a large bowl and mash with a fork. Set aside. In a large pot, melt the butter over medium heat. Add the onion, garlic and celery and saute for 5 minutes. Stir in the flour, dill, curry powder and cayenne pepper. Gradually add the chicken broth and milk to the pot. Bring to a boil. Cook while stirring constantly for 3 minutes. Stir in the squash, salt and black pepper. Cook for an additional 2 minutes while stirring. Transfer the soup in batches to a blender. Process each batch until smooth. Pour the soup in bowls, garnish with bacon pieces and serve immediately. This soup can also be easily frozen. After blending, let the soup cool completely. Pour it into air tight bags or containers and place in freezer. It will last for 3-4 months. Apple and Cheese Stuffed Acorn Squash - this unusual acorn squash recipe makes a fantastic side dish, try it and you'll be a believer, too! 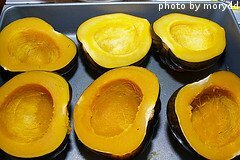 Place the squash halves cut side down in a baking dish and add 1/2 inch of water (more than 1 baking dish may be needed). Bake in preheated oven for 40 minutes or until slightly tender. Meanwhile, melt butter in a large skillet over medium heat. Add the onion and apples and saute for 12 minutes. Pour mixture into a bowl and set aside to cool. When done, remove the squash from the oven. Drain the water from the baking dish and turn squash halves cut side up. To the apple mixture, add pineapple, brown sugar, cinnamon, nutmeg and Cheddar cheese. Still until well combined. Divide the apple mixture evenly and stuff each squash half. Sprinkle cracker crumbs on top of the stuffed squash. Return the stuffed squash to the oven and bake an additional 15-20 minutes at 350 degrees F, or until the cheese has melted and the cracker crumbs are golden brown. Serve immediately. Heat oil in a deep skillet over medium heat to 350 degrees F.
In a small bowl, whisk together egg, milk and hot sauce. In a separate shallow bowl, mix together flour, cornmeal, salt, black pepper, cayenne pepper and garlic powder. Dip the squash sliced into the egg mixture, then dredge in flour mixture. Drop into preheated oil and fry about 2 minutes on each side, turning once. Remove from oil when golden brown and let drain on paper towels. Immediately sprinkle fried squash with salt after removing from oil. Continue to fry squash in batches until done. Serve immediately. Can be served with ranch, blue cheese or sour cream dipping sauces. We hope you've enjoyed some of our favorite acorn squash recipes.